It might be Lando’s Millennium Falcon, but if you want to get the most out of this hunk of junk you might want to let The Corellian Kid take the helm. We talked about Lando’s Millennium Falcon already. But today we’re taking another look at the most famous YT-1300 from a galaxy far, far away. And this ship is flying under new management. 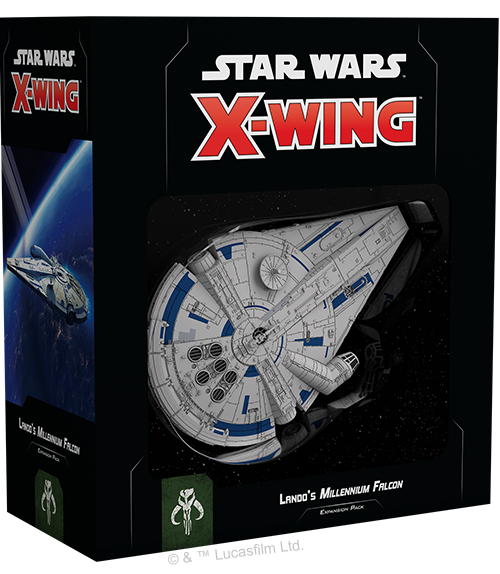 Fantasy Flight Games is showing off some more tricks the Millennium Falcon has up it’s sleeves. 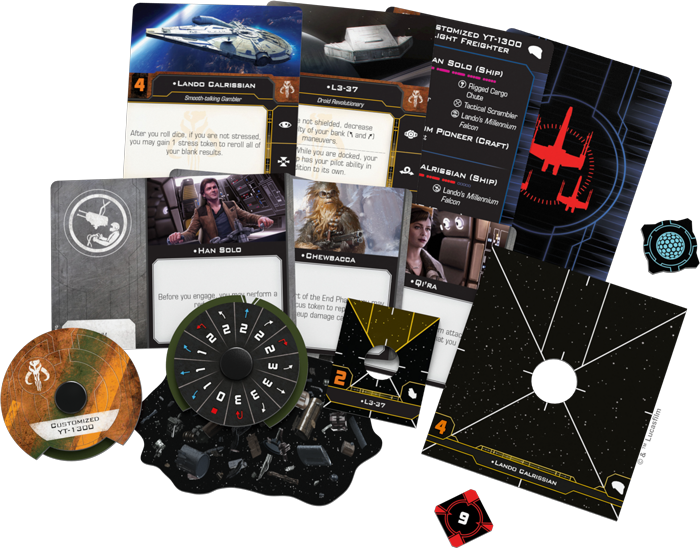 Anyways, let’s take a look at some of the other pilots – including one of the best in the Galaxy: Han Solo. Han is a PS 6 – that’s about as good as it gets! 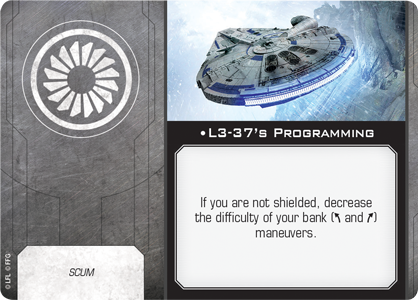 Unsurprising to Star Wars fans, that means Han will get to move last and shoot first – that should allow him to take full advantage of his dual-arc turret. And, if you can line up your shot, you’ll get a bonus die on the attack and defense if you can squeeze an obstruction in the way. 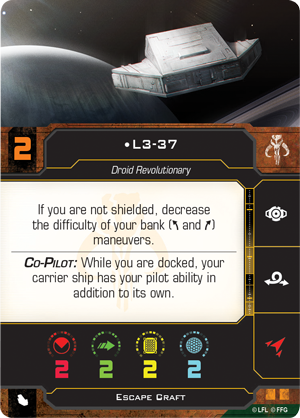 L3-37 might not be the best pilot in the galaxy but the ability speaks for itself. Your 2 and 3 banks become blue (which is the new ‘green’ for all you 1.0 players). So your banks will allow you to drop stress with ease. Actually now that I have taken a closer look at the dial, I’m a little surprised this ship doesn’t have a 4 speed maneuver just because it IS the ship that made the Kessel Run in less than 12 parsecs. 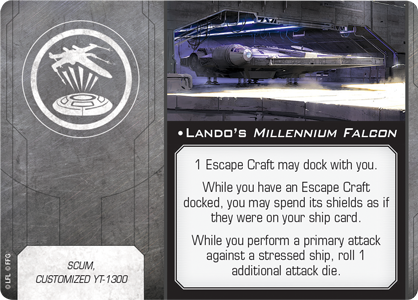 With Lando rounding out the pilots of the main ship, let’s take a look at the detachable Escape Craft and it’s pilots. 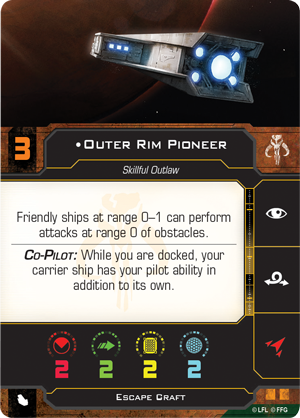 The Outer Rim Pioneer is a pretty sweet accomplice to have around. As a new Co-Pilot, you get the benefit of having this little guy around. If you do happen to bump or land on an Obstacle you still get to attack. Hey, everyone bumps asteroids occasionally. 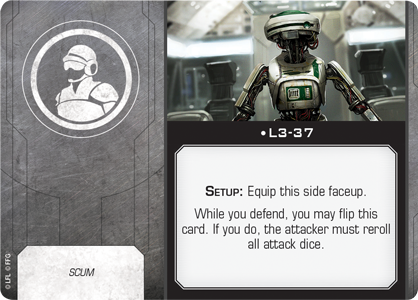 Oh you didn’t think L3-37 wasn’t going to also get to be a Co-Pilot too, did you? Pass over that sweet, sweet blue bank sauce! 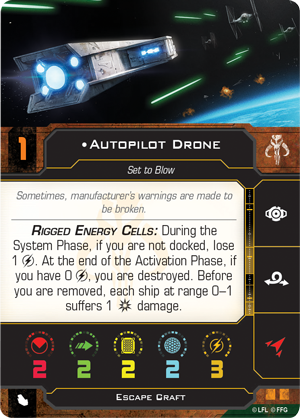 The Autopilot Drone is perhaps one of the most dastardly tricks we’ve seen from the Falcon. 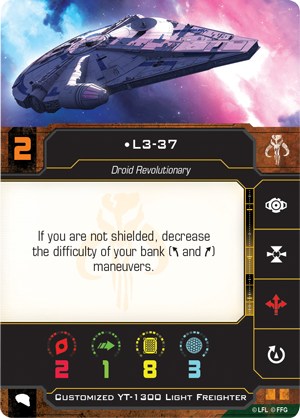 If you can time it right and if you can get this ship in range, you can actually cause quite a mess of your opponent’s plans. it’s a “Free” crit which can cause some nasty side effects. First off we have the ship title. Naturally, this grants you the ability to have a docked Escape Craft. This nets you some extra shields which can come in handy. Secondly, if you’re attacking a stressed ship, you’ll get an extra attack die. 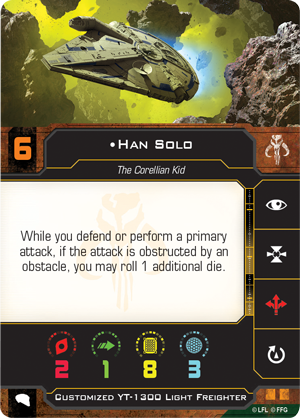 Doing some quick math if you are letting Han pilot with this title and you’ve got some obstructions around, then you can pull off a 4 die primary attack. Sign me up! A pilot and a ship can do a lot – but sometimes to get the most bang-for-your-buck, you need a good crew to help out. L3-37 joins the crew as an option. I’m very curious if the other side of this card has any effect as it would be strange for this to be a one-and-done card. Then again, it’s kind of a powerful ability if Lady Luck is on your side. L3-37, why can’t I quit you! It’s the Blue Banks. I need them in my life. You bring the Blue Sparks in Mario Kart and you bring them in X-Wing. Oh hey Chewie, I didn’t see you there. Do you bring the Blue Sparks? No? Well what do you do then?! Oh you let me use my excess focus to repair the ship…That’s actually really handy. But seriously, what’s up with those goggles? Are you in your Hipster phase? I can’t wait for you to grow out of it and get a Bowcaster already. Frakin’ Hipsters. 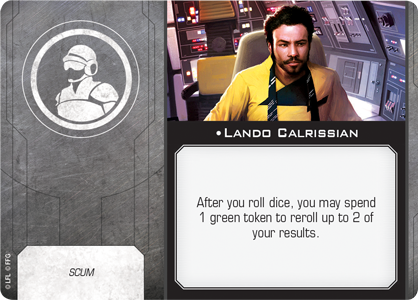 Lando! You’re a gamblin-man and I respect that about you. Your crew ability can really help us get out of jams, too. I know this ship is technically yours (it says so on the title card) but when I own it, you can still totally ride shotgun. I love re-rolls. 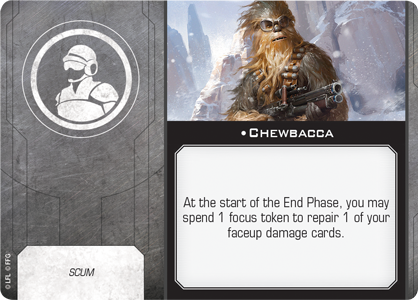 That’s it for this preview – The new expansion drops right along side the core set on September 13th, 2018! Get ready to take an old friend out for a new spin.